Flowers flow from trumpets played by a Puerto Rican man and young boy. Historic black and white photographs of three white immigrants taking citizenship oaths. 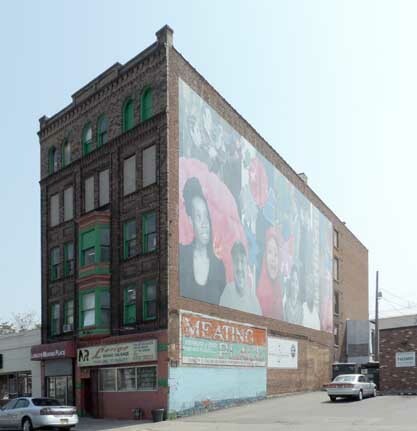 "Grant Street Global Voices" is a Young Audiences initiative in collaboration with Buffalo State, its Community Academic Center (CAC), and Grant Street business owners. The project honors the voices of the young people from this burgeoning immigrant and refugee community. 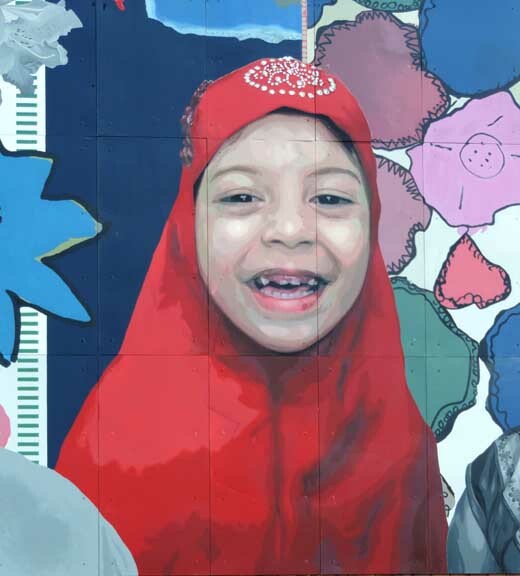 Its overarching goal is to use art to welcome their stories, and to build a sense of community among the young people. 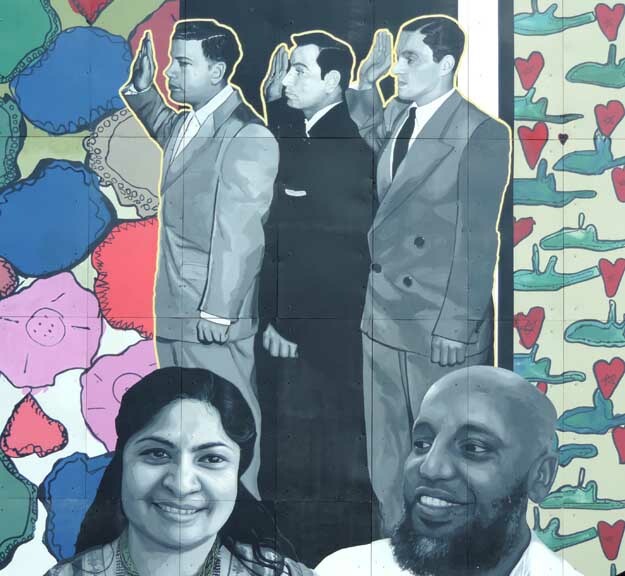 Teaching artists Augustina Droze, Ismail & Company, Ellen Melamed and Buffalo State Arts Ed students worked closely with students from Lafayette and 45 to gather the stories of their families and capture it in words and art. Today, Buffalo is still the home of immigrants– and a growing number of refugees. 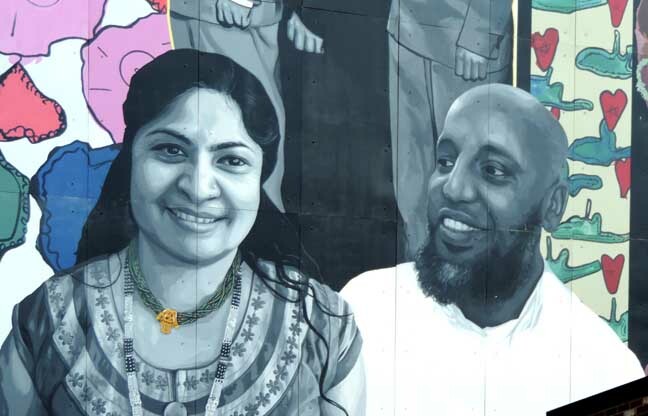 Residing mainly in what’s known as the “west side,” immigrants and refugees from Burma (Myanmar), Bhutan, Eritrea, Iran, Iraq, Somalia and Sudan, have chosen to or have been selected to move here. 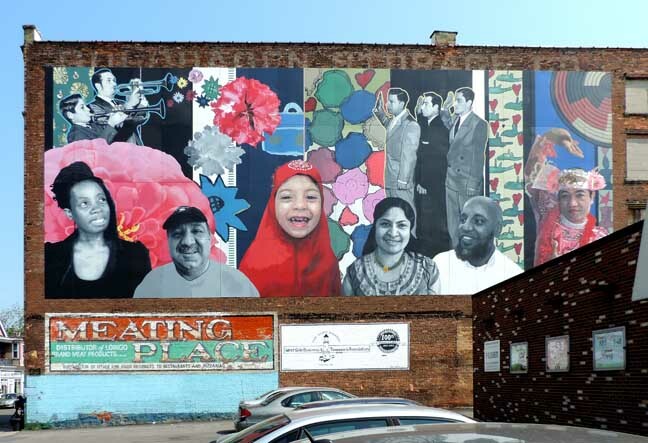 “Grant Street Global Voices” – with photographic images of past and current residents, portrayals of diverse cultures and a clash of vivid colors and patterns with gray tones – was created by muralist Augustina Droze with help from students at International School 45 and Lafayette High School. 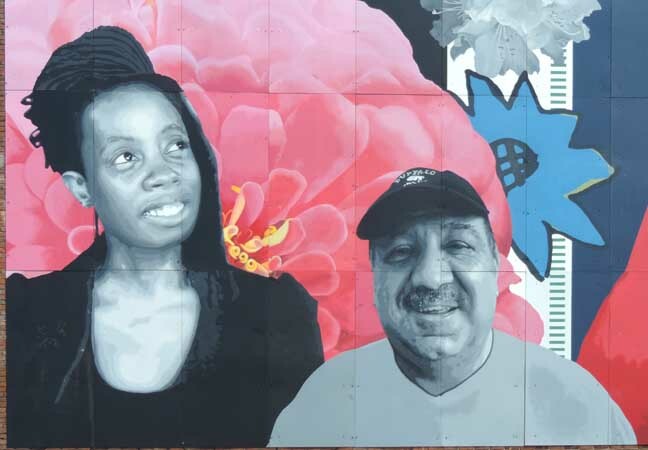 “It was a great project to work on, just to know all the stories of the people and the immigrant and refugee communities here,” said Droze, who also has created murals on the west side of McKinley High School, and on Elmwood Avenue near Bidwell Parkway ["Feast"]with artist Bruce Adams. Droze said it took about a year of planning and 2½ months of painting. The students did the more abstract designs. 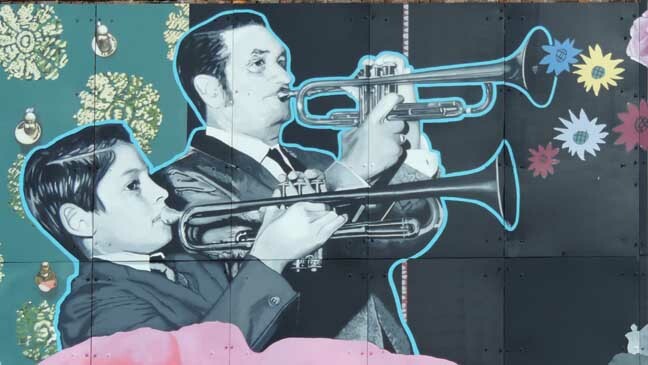 The mural consists of 80 4-by-8-foot aluminum panels, which were mounted onto the wall by a sign company. 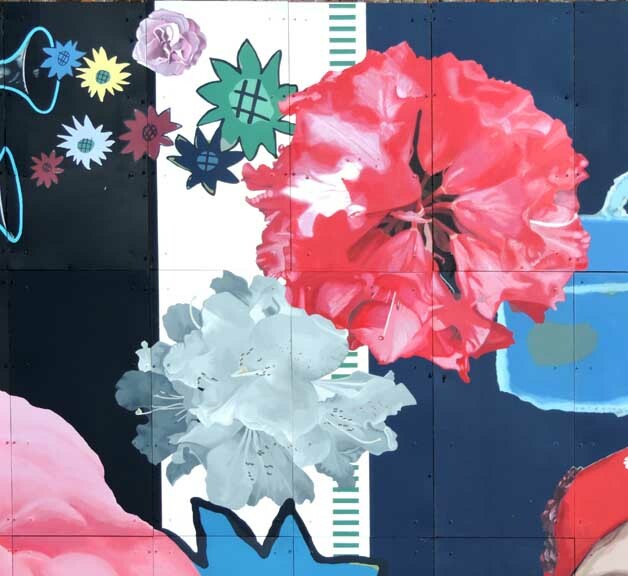 The collaborative process included teaching artists from lead organization Young Audiences of Western New York, which connects artists with young people in schools and after-school programs, and which secured the $75,000 National Endowment for the Arts “Our Town” grant. Art education students from the SUNY Buffalo State Community Academic Center also worked with the students, and the City of Buffalo was a key supporter. Augustina [Droze] has officially moved to Buffalo from LA, recently bought a house, and is married and raising a family. That’s pretty neat, considering that she came to Buffalo to paint a mural with no intentions of staying. 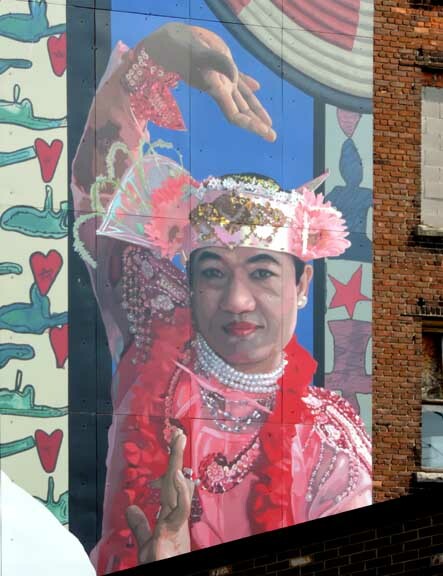 And just think of what she has accomplished in her short time living in Buffalo – three significant murals and a smattering of smaller works throughout the city. Plus, she’s helping to teach others how to produce high quality, long-lasting public works of art.